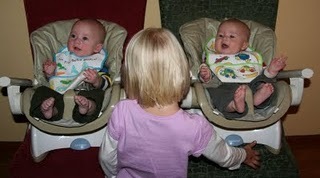 After sleeping all night for weeks, over the past few weeks both boys had started to wake up almost every night. 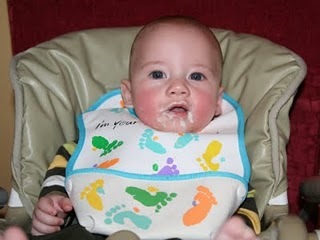 I checked one of the “is your baby ready for solid food” quizes…and the answer was yes for all 10 questions. 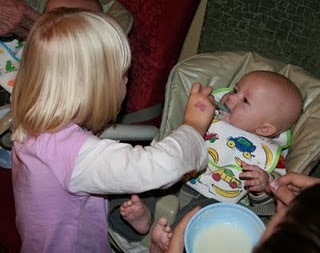 So Tuesday evening they each had their first bowl of cereal. 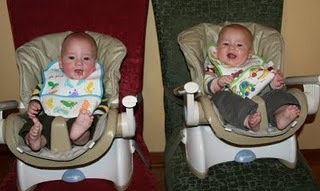 Instead of full size highchairs, we purchased these compact chair-top versions. They still recline and will work much better for us and our available space. The boys were very excited when we put them in the seats – they were happy to kick and look around and be amused by Juliana. 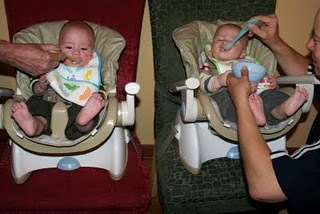 Scott insisted that they both get their first bite of food at the exact same moment, thankfully we had another adult on hand so I could take pictures. Juliana did get in on the fun as well. After feeding Ruslan 2 bites she was bored and wandered off to play. Both of them did such a good job, kept most of the food in their mouths and seemed to get the hang of pushing the food to the back of their mouths quickly. 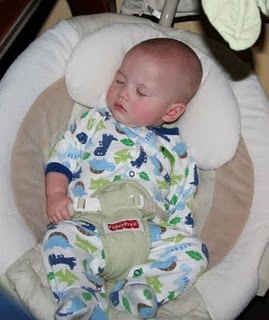 Ruslan was fussy when we got home today, but as soon as I put him in his chair he sat back and smiled. I don’t think that anyone is surprised that Ruslan is excited for more food. 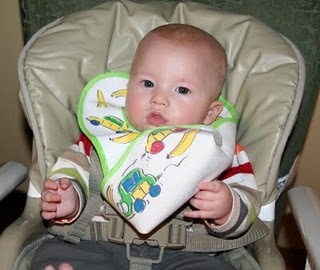 In between bites of food Wyatt was making little noises, asking for more. 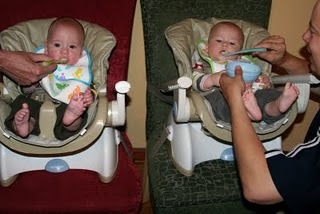 When they were done eating Ruslan was happy to sit in his chair and kick and Wyatt was very chatty. (ignore my silly, mommy voice) Apparently blogger and facebook are not playing nice tonight – click here to view the video until it appears in this post. 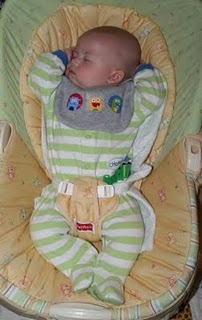 10 minutes later, they were both passed out, sound asleep – happy, tired babies.